The shrew-opossum Caenolestes fuliginosus. Photo from here. Those of you who are familiar with the more encyclopaedically-arranged natural history books will almost certainly have encountered the phenomenon of the Mysterious Name. In the introductory section of the book, where the scope of the text is indicated, there'll be some sort of taxonomic listing - the phyla of animals, for instance, or the families of birds - with each of the taxa listing being described in a subsequent part of the book. But often, if you're the sort that will pore over such a listing closely enough, you'll notice that the listing includes at least one name, one taxon (often more) on which the remainder of the book is silent. It's there in the beginning, it has its place firmly indicated in the hierarchy - and then silence. One taxon that throughout my youth remained to me a mysterious name was the Caenolestidae. 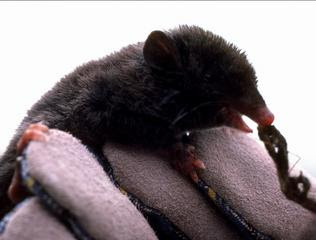 Caenolestids are small South American marsupials, commonly known as shrew-opossums*. In most lists of marsupial families, they'll be near the beginning, after the true opossums of the Didelphidae. But all the books I read as a child would skip straight from Didelphidae to Dasyuridae, with nary a hint of anything in between. *Another sign of their obscurity in the public eye - that they are only given the names of other animals, rather than being thought deserving of a name of their own. Admittedly, the caenolestids are not a large family. 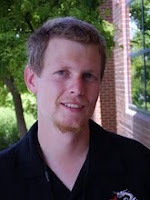 Gardner (2005) lists just six species in three genera, Caenolestes, Lestoros and Rhyncholestes. Four of those species are in Caenolestes, the other two genera are regarded by Gardner as monotypic (though one effect of their understudied status is that no two authors will entirely agree on the caenolestid species list, and some authors may recognise two species in either or both of the smaller genera, while others will recognise only a single genus with as few as three species). Of course, that's still more species than other mammal families such as Rhinocerotidae or Hominidae that have no trouble claiming page space for themselves, and while caenolestids may be few in number now, they were more abundant in the past. Caenolestids were the most abundant small marsupials in South America during the early Miocene (Marshall, 1980). Lestoros inca. Photo by Phil Myers. Living caenolestids are widespread, and probably not particularly uncommon, but specimens are few and far between. This has mainly been blamed on their unobliging choice of habitat - they prefer very dense, humid forest, though they may be concentrated close to open meadows (Nowak, 1999). 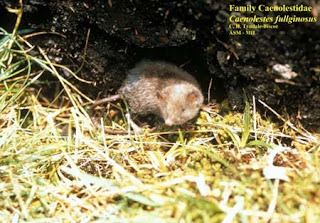 They are shrew-like in appearance (hence the common name), and females lack a pouch (presumably the young just hang directly onto the teats, but females with emerged young seem to have not yet been observed). The front of the lower jaw contains an elongate, procumbent pair of incisors, on which more in a moment. The animal would move toward a rat, sniffing vigorously, seize and lift the rat with its forepaws or pin it to the substrate, and bite it several times quickly with its incisors. 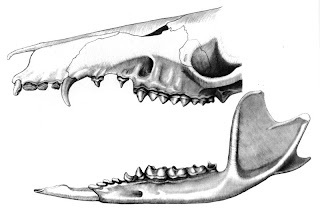 The caenolestid would then commence eating the rat by biting off a section of the head with its cheek teeth and take successive bites posteriorly. In fact, the large incisors were used rarely by caenolestids in feeding - almost all biting and chewing was done with the cheek teeth, and the incisors are primarily for dispatching prey. Caenolestids have a distinct flap on either side of the upper lip, and this probably protects the face and whiskers from getting clogged up with blood and dirt while the animal is busy stuffing prey towards the back of its mouth. When offered larger food items such as earthworms, the caenolestids would sit upright on their tails and use their front paws to manipulate their food, similar to the way a mouse does. Skull of Caenolestes condorensis, so you can get a better look at those lower incisors which a such bad news if you're a baby mouse. Image from here. Fossil caenolestids (or near-caenolestids, depending on your preferred classification) were ecologically more diverse than modern species, and a number appear to have been herbivorous. One such genus, the Miocene Abderites, had a large sharp and multi-grooved first molar like the teeth of the multituberculates. 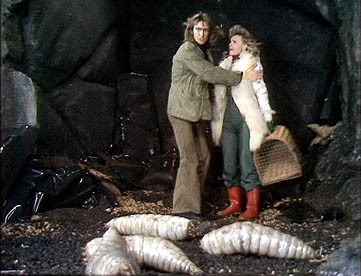 Marshall (1980), in the last major review of the fossil caenolestids, suggested that the arrival of the caviomorph rodents in South America was what triggered the demise of the caenolestid herbivores, while the more generalised insectivores/carnivores were able to keep sailing on. Phylogenetically, caenolestids have been difficult. Perhaps the most honest representation of our current state of knowledge of marsupial phylogeny would be a trichotomy between the caenolestids, didelphids and australidelphians (Australian marsupials), with all possible relationships between these three having been suggested in the past. Some earlier authors suggested a relationship between caenolestids and the Australian diprotodont marsupials on the basis of the procumbent incisors, but this hypothesis was pretty firmly flattened when it was established that a different pair of incisors was involved in each of the two groups. Perhaps the most popular option at present is that caenolestids are the sister to australidelphians, to the exclusion of didelphids, as supported by some molecular data (Springer et al., 1998). However, a relationship between didelphids and caenolestids remains a distinct possibility due to the occurence in both of sperm pairing. After leaving the testes, sperm of members of these two families connect up to each other, forming a single moving pair (perhaps enabling them to swim faster through the uterus). However, the homology of this character is debatable, as the sperm connect in a different place in the different families. Gardner, A. L. 2005. Order Paucituberculata. In D. E. Wilson & D. M. Reeder (eds.) Mammal Species of the World: A taxonomic and geographic reference pp. 19-20. JHU Press. Kirsch, J. A. W., & P. F. Waller. 1979. Notes on the trapping and behavior of the Caenolestidae (Marsupialia). Journal of Mammalogy 60 (2): 390-395. Marshall, L. G. 1980. Systematics of the South American marsupial family Caenolestidae. Fieldiana: Geology, new series 5: 1-145. Nowak, R. M. 1999. Walker's Mammals of the World, 6th ed. JHU Press. Springer, M. S., M. Westerman, J. R. Kavanagh, A. Burk, M. O. Woodburne, D. J. Kao & C. Krajewski. 1998. The origin of the Australasian marsupial fauna and the phylogenetic affinities of the enigmatic monito del monte and marsupial mole. Proceedings of the Royal Society of London Series B - Biological Sciences 265 (1413): 2381-2386. At the risk of destroying your dream, I suspect field work is not involved at all. Probably dissections instead.